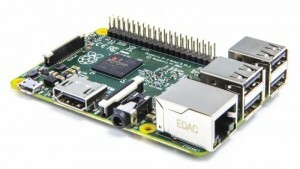 Raspberry Pi 2 was unveiled February 2, 2015 for sale at the same price as the existing Model B+. This has an identical form-factor to the existing Raspberry Pi 1 Model B+. All of the connectors are in the same place and have the same functionality, and the board can still be run from a 5V micro-USB power adapter. It also has complete compatibility with Raspberry Pi 1. Raspberry Pi 2 has a new System-on-Chip (SoC) BCM2836 900MHz quad-core ARM Cortex-A7 CPU and a full 1GB of LPDDR2 SDRAM. The new ARMv7 processor means it can run the full range of ARM GNU/Linux distributions, including Snappy Ubuntu Core, as well as Microsoft Windows 10. Raspberry Pi 2 has backwards-compatibility with all previous Raspberry Pi models but can, however, run “bigger and more powerful projects” owing to its upgraded CPU and RAM specifications.